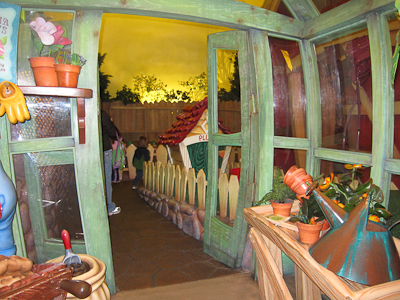 Way in the back of the park past Small World is a little land called Toontown. Toontown is the home of the classic Disney characters (Mickey, et al.) 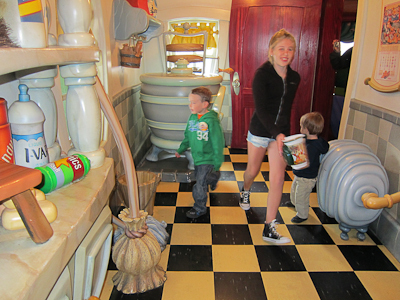 as well as the lamest ride in the whole park, Roger Rabbit’s Car Toon Spin. Mickey and Minnie also have their homes there. Did I know this? No I did not. 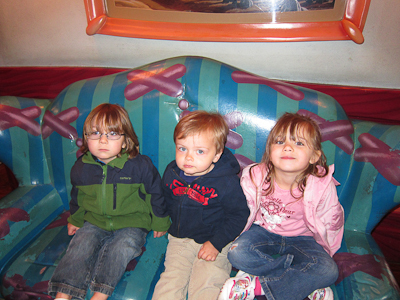 But we met up with my cousin Tracy and her two kids, Addison and Luke, over in Toontown and they wanted to go see Mickey’s house, so there ya go. 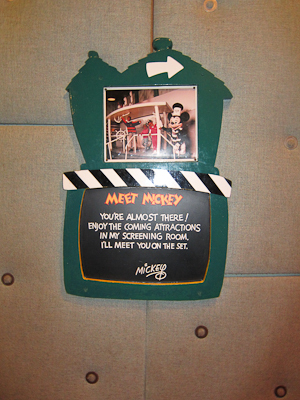 Mickey’s house is a walkthrough which culminates in Mickey’s Movie Barn and photo opportunity. Mickey is supposed “filming” in said barn. 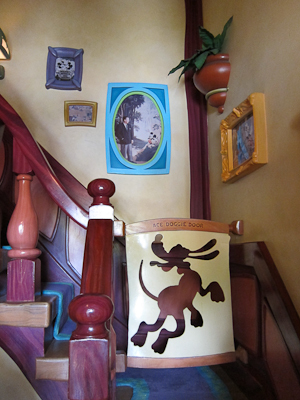 Like the rest of Toontown, Mickey’s house is chock-full of massively oversized stuff that is pretty impervious to small children. OMG, I’m one of THOSE parents. You know the ones. The ones who let their children run all over the place smearing their grubby little peanut-butter-and-jelly hands on Disney property or elsewhere. Mere moments before Theo marched up the stairs and plopped himself down. Fortunately, he didn’t make it past the Pluto gate. 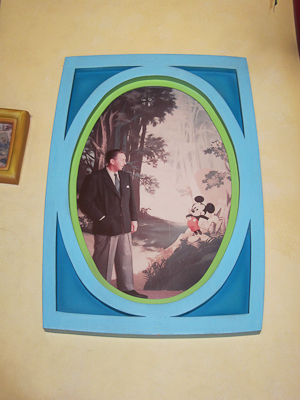 On the wall behind the stairs was a very charming picture of Walt and Mickey. In the next room, both Tracy and I were trying to take pictures. As anyone with children can tell you, it’s a statistical impossibility to take a picture of multiple children and have them all looking at the camera at the same time. Most of our pictures look like this. "Theo, look at the camera! Smile Addie! Look over here, Luke! Over here, Theo! Over here! Say Cheeeeeeese!" So it was pretty much a personal victory to get this shot, despite the fact that two out of the three look rather disgruntled. Theo thought he was going to like the oversized chair, but the pattern displeased him. This is so gauche. Mickey needs a new designer. 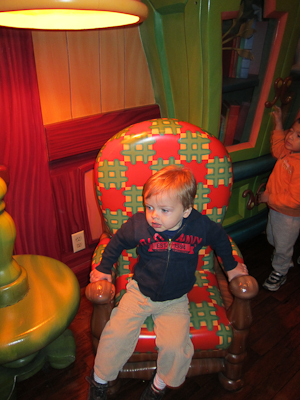 He was also mesmerized by the television showing real cartoons. "They're heeerrreee." "Don't go into the light, Carol Anne!" Mickey doesn’t do a lot of cooking. That giant thing is a dishwasher, but where's the oven? But he does have a garden. Mickey only eats organic. How else do you think he lived this long? 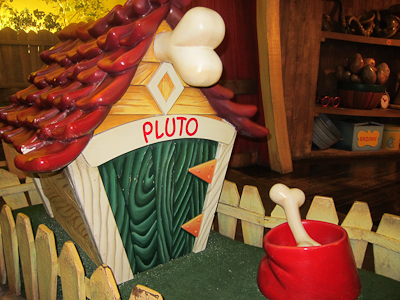 While we all know that the proper place for a dog is inside the house cuddled up in the human’s bed while they sleep on the couch or floor, Pluto does have some pretty nice digs outside. 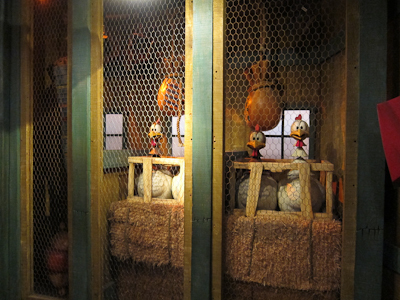 Mickey also has some chickens. They were cooped up when we saw them, but I’m going to assume that they get access to the fresh air and sunlight and plenty of exercise, and are entirely grain-fed. Mickey would never abuse his chickens, people! 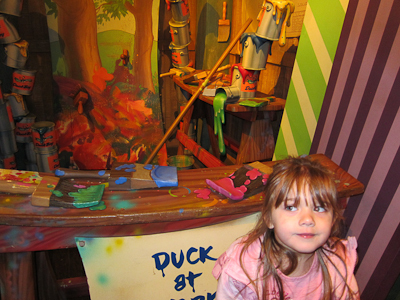 We did find Addie in time to take a picture of some sort of painting accident scene. Then you are funneled outside, except it isn’t actually outside because it’s all enclosed. It’s like some kind of secret bunker where you can move from room to room while the air raid sirens blare. Except that it’s above ground and it’s Mickey’s house at Disneyland. I'm not sure I entirely believe this. We peeked into the “barn” but there was no equipment like I saw when I was almost on Oprah. 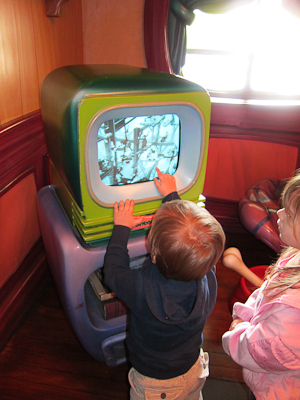 There was a big zig zagging line and a large screen showing Mickey cartoons after which you get to meet Mickey and get a picture. 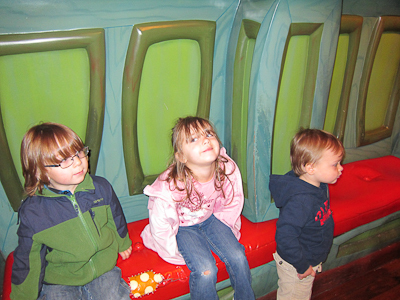 However, at that point the kids were antsy (and we were still missing one of them) so we decided to pass. 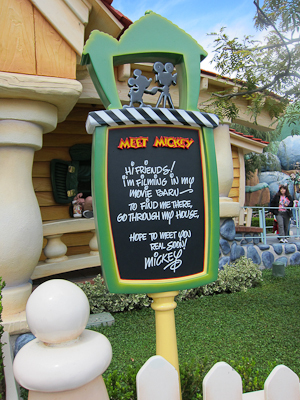 So, that’s Mickey’s house and the Mickey meet and greet in Toontown!